This learning guide, commissioned by the Collaborative Adaptation Research Initiative in Africa and Asia (CARIAA), is designed to provide research teams with a bottom-up and experience based tool to better understand the effectiveness – and inefficiencies – of different approaches to Research-into-Use (RiU), the uptake of research which contributes to a change in policy or practice. The learning approach can also help to facilitate adaptive and reflexive approaches to RiU. 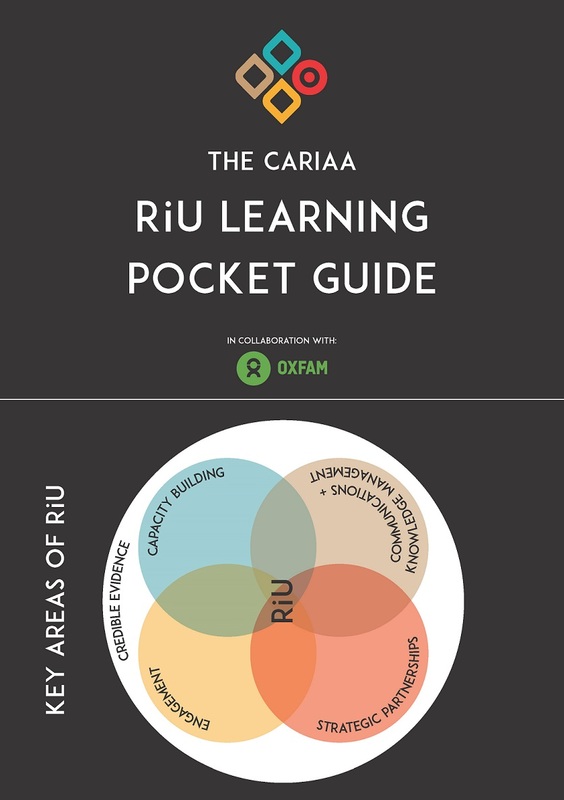 Although this guide was developed for CARIAA, it has been designed so that any research programme interested in improving its RiU practices can use it. It also includes a pocket guide for easy use in the field. You can download the full guide from the right-hand column. Research-into-Use refers to the uptake of research which contributes to a change in policy or practice. Research uptake and RiU can be strongly connected to the research process itself, for example through the use of participatory or co-productive research methods for designing research, gathering evidence and doing analysis, which can increase the uptake of research at the earliest stages. As described in this guidance note, there are also a range of activities that can be undertaken alongside evidence gathering that promote RiU. Figure 1 from page 1 of the guide: Key areas of activity to achieve Research into Use in CARIAA, highlighting the multiple scales of potential impact. How management of RiU can be made adaptive in order to incorporate lessons learned. An emphasis on RiU offers not only an opportunity to learn, but also an opportunity for increased collaboration across consortia. Independent of research themes and locations, key aspects of RiU such as stakeholder engagement, communication, the development of strategic partnerships and capacity development (see Figure 1 above), can be tracked and leveraged in order to maximise the program’s effectiveness in engaging and influencing decision-makers and other stakeholders in support of program objectives. A coordinated approach to tracking and learning from RiU could also reveal opportunities to influence policy and practice collectively. The Euforic Services team used an inductive approach to developing this learning approach and Guide, drawing from existing consortium and programme practice. This involved conducting interviews with CARIAA members and undertaking a review of consortium and programme-level strategy documents to take stock of current RiU processes and strategies. From this we idenfied key themes which cut across all five strategies (four CARIAA consortia plus CARIAA programme-level) as well as gaps where consortia have not yet idenfied ways for tracking or learning from RiU practice.